This June, a meeting on cross-border infrastructure projects brought CRIDF and some of its key collaborators to the offices of the Zambian Ministry of Water Development, Sanitation and Environmental Protection in Lusaka. The meeting was organised by the Southern African Development Community (SADC) Regional Water Fund in order to establish closer working relationships between the Government of Zambia – as a SADC Member State – and its partners on water infrastructure projects. The delegation from CRIDF was led by Chief Engineer Leonard Magara, who, along with the SADC Water Fund, met with the Ministry’s Department of Water Resources Development and Department of International Rivers, and the Transboundary Water Management project of Deutsche Gesellschaft für Internationale Zusammenarbeit (GIZ-TWM). The SADC Member States identified the development of water infrastructure along transport corridors as pivotal to reaching their regional objectives. Transport corridors are busy transport routes between places where commodities are produced and where they are sold. Over time, infrastructure and communities develop along these routes due to the high volume of traffic passing through. The SADC Member States acknowledged that developing water infrastructure along transport corridors will improve commerce in the region. Currently CRIDF, in consultation and collaboration with SADC, is preparing a water supply and sanitation infrastructure programme for the key points along transport corridors in support of SADC’s agenda. To date, CRIDF has screened 34 potential infrastructure projects at border towns throughout SADC. 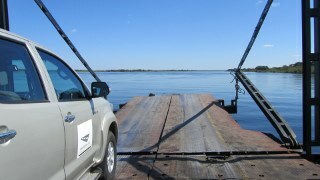 This programme builds on the Zambia 12 (border) Towns Programme. CRIDF funded full preparation and construction of new water supply and sanitation infrastructure for four posts on the country’s borders with Botswana, Malawi, Mozambique and Zimbabwe. The SADC Water Fund is funding the larger project at Kazungula, a Zambian town that lies very close to the borders of Namibia, Botswana and Zimbabwe. As well as providing climate resilient water supplies at these busy border towns, the projects improve sanitation which contributes to the fight against waterborne diseases. This is particularly important in border towns, where an outbreak of disease can lead to possible border closure to prevent transmission across country boundaries.